Hot. 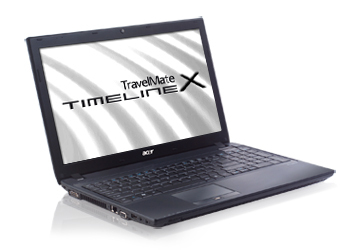 Acer launches its new TravelMate TimelineX generation onto the highly competitive market. The 15.6 inch 8573TG proves to have a stable system with good workmanship and first rate computing power. However, the notebook with the anti-glare screen mutates to a small heater when it's put under enough stress. Mobility and security are the two most important features that Acer focused on while developing its TravelMate TimelineX 8573G. Therewith, the notebook manufacturer is aiming at business users. Acer briefly specifies the battery life as "8+", and states a weight of 2.55 kilograms. Depending on its configuration, the device is sold for starting at 700 euros. An Intel Core i7-2620M is built into the model, Acer TravelMate TimelineX 8573TG-2624G64Mnkk, which we tested. 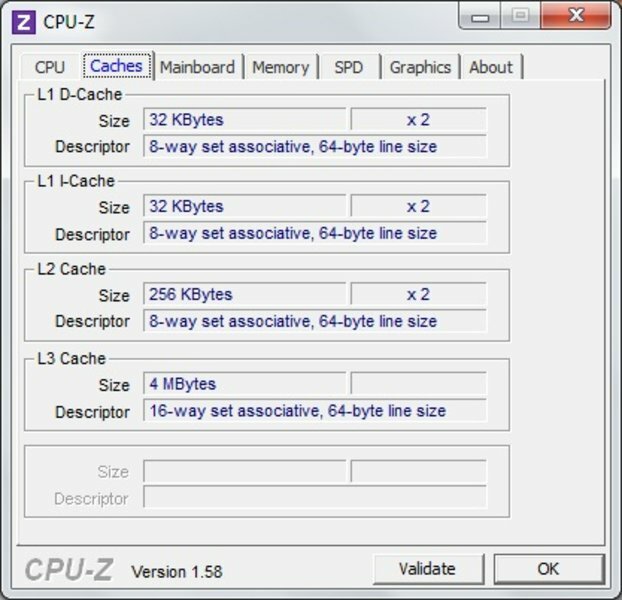 The second generation dual Core i processor's base clock is 2.7 GHz. A clock rate of up to 3.4 GHz is even possible with Turbo Boost support. The Intel HD Graphics 3000 is also embedded in the processor based on Sandy Bridge architecture. Moreover, Acer has installed the dedicated graphics card, Geforce GT 540M, under the hood for even more graphics power. This supplies you with a memory capacity of 1024 MBs. The system switches between the incorporated and dedicated graphics automatically, depending on the requirements. That results in a lower power consumption. The 15.6 inch anti-glare screen with an aspect ratio of 16:9 has a native resolution of 1366x768 pixels. In addition to the 4 GB of RAM, a 640 GB hard disk has been built-in. Looking at the sheer technical specs, the Acer TravelMate TimelineX 8573TG seems to be a good machine. Find out in the following review which drawbacks we found in practical use. Acer has completely revised the TravelMate TimelineX 8573TG's case. The black case is made of a magnesium aluminum alloy. This adds to the case's stability and robustness. The case can hardly be warped and even the surface around the keyboard copes quite well with pressure. The base plate is also quite stable for the most part. Only the surface in the optical drive's vicinity can be pressed stronger, as is so often the case in notebooks. The screen is kept in place by metal hinges and they do a good job. However, the display lid can be warped easily. The screen can't withstand higher force very well, either. There is no latch. The weight of 2.55 kilograms isn't unusual for a 15 inch laptop. 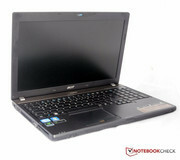 Overall, you can be satisfied with the Acer TravelMate TimelineX 8573TG's workmanship. Acer's TravelMate TimelineX 8573TG has quite a bit to offer in terms of connectivity. The ports are distributed on the left, right and front sides. 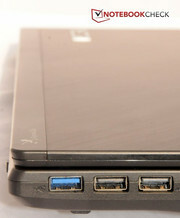 There aren't any ports found on the rear, as it's become common for modern laptops. A cutting edge USB 3.0 port belongs to the interface highlights. There is also an ExpressCard34 slot and SmartCard reader available. The HDMI port can be used for connecting external monitors. The standard communication options are available on Acer's TimelineX 8573TG. We only miss a UMTS module in the business laptop. Thus, Acer offers its customers a Gigabyte LAN (Broadcom NetXtreme Gigabit Ethernet) and wifi in form of the Atheros AR5B97 (bgn). Bluetooth, version 3.0, is also available. Perfect protection against unauthorized access is a must for business users. For this, our test model has a fingerprint reader. Not only the Kensington lock provides enhanced protection, but the Trusted Platform Module (TPM) chip does as well. There aren't any added extras worth mentioning in the scope of delivery. In return, there are at least accessories available optionally. Acer offers a cross-platform docking station called Acer ProDock. It costs about 180 euros. Acer bids a 24 month warranty on its TravelMate TimelineX 8573TG ex-factory. An optional warranty extension of 12 months can be acquired for starting at 70 euros, depending on the scope of services. The keyboard has a full-fledged numpad. The keys are sufficiently sized and deliver a good feedback. The pressure point is low, but doesn't have an unfavorable effect on the typing feel. 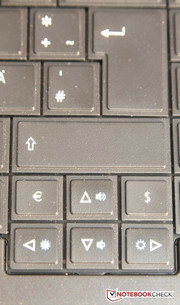 The keys for euro, respectively dollar, signs are located above the right and left arrow keys. All special functions that can be opened via the FN key are highlighted in light blue. The TravelMate TimelineX 8573TG's touchpad is quite big. The sensitive surface is deeper than the area around it. It has good gliding traits. It facilitates working with multi-finger gestures. The corresponding keys don't give reason for complaint, either. They are also big enough and have a crisp pressure point. Acer's TravelMate TimelineX 8573TG is standardly equipped with a 15.6 inch non-glare screen (AUO41EC). The HD display is illuminated by LEDs and has a native resolution of 1366x768 pixels (16:9 format). A small HD webcam is built into the screen's frame. The contrast of 162:1 is very low. The black value could also be lower than the assessed 1.06 cd/m2. As usual, we measured the brightness with Gossen Mavo Monitor. We only assessed an average brightness of 168.7 cd/m2. We recorded a maximum of 183 cd/m2 selectively - too little for our taste. At least the brightness is maintained in battery mode. The brightness is sufficient for indoor use at any rate. It will likely only get critical in outdoor use. Although the screen is anti-reflective, the brightness should at least be over 220 cd/m2 to ensure comfortable working. Acer's TravelMate TimelineX8573TG's viewing angle stability is acceptable. The image remains fairly stable horizontally, even when the viewing angle deviates strongly. Image changes are frequently seen on vertical viewing angles. 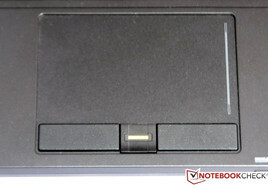 This is also the case in the Acer TravelMate TimelineX 8573TG. 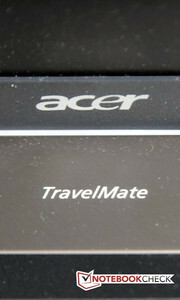 Acer relies on second generation dual Core i processors for all its TravelMate TimelineX 8573TG models. In our case, it's the Intel Core i7 2620M. 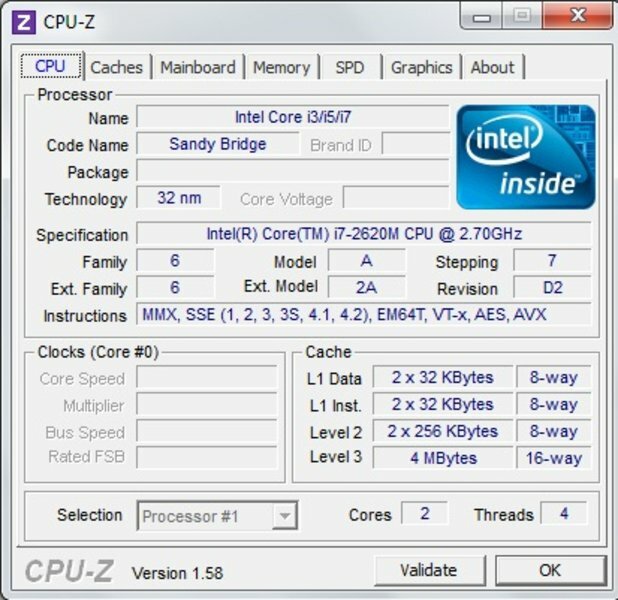 The processor based on Sandy Bridge architecture has a base clock of 2.7 GHz. The chip manufacturer specifies its TDP with 35 watts. Thanks to Turbo Boost 2.0, the processor's clock can be increased up to 3.4 GHz, provided that it's sufficiently cooled. The DirectX10 capable graphics, Intel HD Graphics 3000, is also embedded in the CPU. A dedicated graphics card is additionally installed for more graphics power. Acer has opted for an Nvidia Geforce GT 540M. It has a memory of 1024 MB available. The system switches automatically between both graphic solutions via Nvidia's Optimus Technology, according to demand. As a result, the power consumption is reduced even more. A 4096 MB DDR3 RAM is built-in as working memory. The hard disk comes from Western Digital. It bids a memory capacity of 640 GBs at only 5400 revolutions per minute. We analyzed the processor's performance with help from the Maxon software, Cinebench R10 and R11.5. The laptop with Intel's Core i7 2620M always ended up in the upper third of our benchmark database. 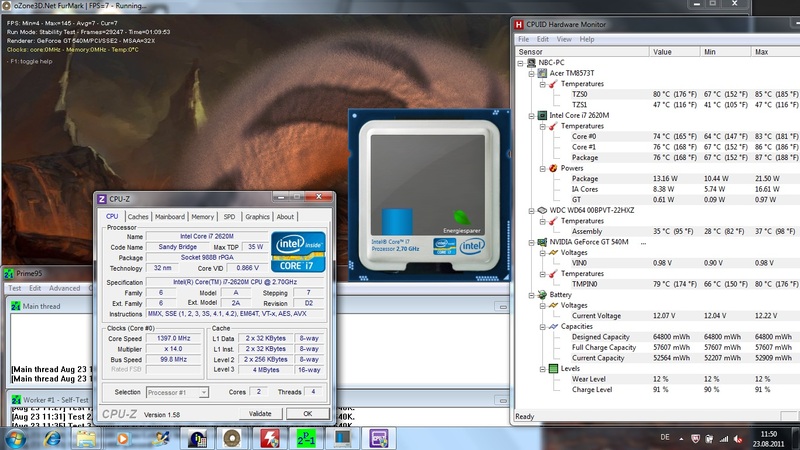 Thus, Acer's TravelMate TimelineX 8573TG managed good 11508 points in Cinebench R10 multi (64 bit). The processor's Turbo Boost was enabled so that it always finished the task with a clock of 3.2 GHz. Consequently, Acer's system is exactly between other laptops with the same processor. Currently, HP's EliteBook 8460p is at the top with 11684 points. The Acer laptop belongs to the best laptops that have an Intel Core i7 2620M with the same score of 3.1 points in the CPU test, Cinebench R11.5. We tested the system's performance with the benchmarks, PCMark Vantage and PCMark 7 from Furmark. Acer's TravelMate 8573TG finds a place in the upper third of the benchmark database with a score of 6532 points in PCMark Vantage. 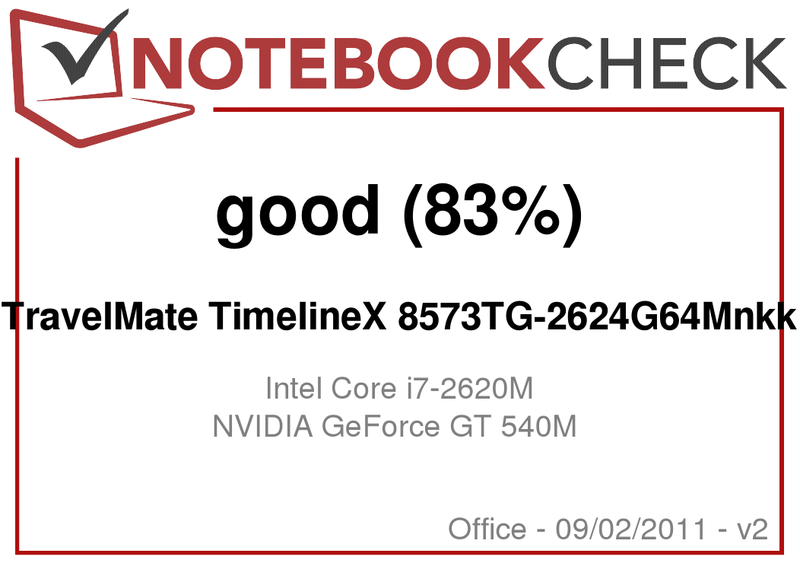 This result would likely look different if the Acer laptop didn't work with Nvidia's Geforce GT 540M, and could only fall back on the incorporated Intel HD Graphics 3000. The Apple MacBook 13 only accomplished 6009 with that configuration. It was only enough for 1837 points in PCMark 7. Other systems with a similar configuration achieve much better scores here. Dell's XPS 15z achieves 2633 points with the same processor and a GeForce GT 525M. We looked at the Nvidia Geforce GT 540M graphics card's 3D performance with a few 3DMark benchmarks from Furmark. The Acer TravelMate series' model scored a total of 7662 points in 3DMark 06. Schenker's XMG A501, with the same graphics card and the same processor, manages a bit more with 8000 points. Overall, Acer's TravelMate TimelineX 8573TG is in the upper midfield. In 3DMark 11, the test device is in the exact center of other notebook with a Geforce GT 540M in our benchmark database with 985 points. The hard disk in the Acer notebook comes from the manufacturer Western Digital. It has a sufficient memory capacity of 640 GBs. The HDD (model WDC WD6400BPVT-80HXZT1) however only has a speed of 5400 revolutions per minute. This is reflected in the transfer speed. We measured an average transfer speed of 59.1 MB/s. A faster hard disk would have been appreciated here. Since the laptop is primarily aimed at business customers, the gaming test will be kept rather short. We tested the laptop's likely gaming performance with two up-to-date games: Mafia 2 and Dirt 3. Both games weren't a problem in low settings. The games ran smoothly even in medium settings and medium resolution. Stuttering was first noticed in higher details. Nevertheless, the games were playable in the highest resolution of the built-in screen (1366x768). We first experienced problems when we used an external monitor. 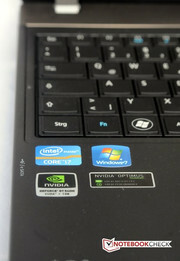 Other laptops partly did a much better job with the Nvidia Geforce GT 540M in the gaming test. While our test device managed 46 frames per second (average) in Dirt 3 (high), the Asus K53SV-SX131V (2410M/Geforce GT 540M) reached 54 fps and Toshiba's Satellite P770-10P (2630QM/Geforce GT 540M) accomplished significantly higher 61 fps. You usually need a quiet notebook to be able to concentrate on your work. So, the device should make as little noise as possible. Our test device is still fairly quiet in energy savings mode. The Voltcraft SL 320 measured between 31.2 dB (A) and 34.1 dB (A). The built-in hard disk hardly makes any noise with its 5400 revolutions per minute. We recorded mere 30.6 dB (A) for it. It's even possible to absolutely concentrate on a movie during DVD playback. We only measured about 33.7 dB (A) in this case. When the TravelMate model is pushed to its performance limits, the fan rotates a lot faster and is significantly more audible. While the system was noticed with 38.8 dB (A) under medium load, the Acer laptop was loud during full load with constant 41.3 dB (A). The latter rates can already be called disturbing. The notebook stays fairly cool when simple office tasks are executed on the Acer TravelMate TimelineX 8573TG. The maximum temperature we measured on the top was only 28 degrees and 29.7 degrees on the bottom. But it can get a lot warmer. 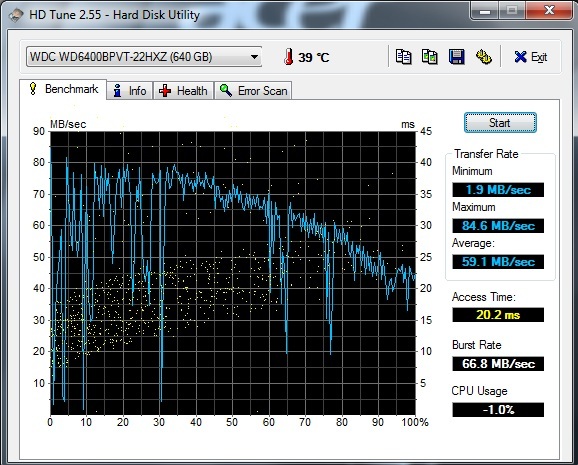 We put the notebook under heavy demand for over an hour with Furmark and Prime95 and measured the surfaces' temperatures again. Quite different rates were shown here. The top reached a peak value of 46.2 degrees and the bottom also heated up to 48.9 degrees selectively. Using the notebook on the lap is no longer possible with these rates. The wrist-rest temperature was averagely around 36 degrees, which is also not very agreeable. Nevertheless, there shouldn't be any restrictions due to increased surface temperatures during office use. We checked the CPU's and GPU's behavior under extreme load in a multi-hour stability test with Furmark and Prime95. The CPU clock occasionally dropped to 1397 MHz. Interesting: The CPU's temperature of about 80°C remained far from the critical maximum. We ran 3DMark 06 and Cinebench R11.5 & R10 immediately afterwards. Both benchmarks finished with approximately the same score as in a cold state. Turbo Boost immediately increased the CPU to 3.4 GHZ in Cinebench R10 single test and only dropped to 3.3 GHz for a short time. Thus, throttling as observed in the stress test should be limited to unusual maximum load scenarios in routine use only. The Acer TravelMate TimelineX 8573TG's speakers are located on the laptop's front. The sound is very thin due to the lack of bass. You would be well advised to use external speakers for listening to music. A 3.5 mm jack is also installed on the front for this case. (-) The average temperature for the upper side under maximal load is 38.1 °C / 101 F, compared to the average of 29.4 °C / 85 F for the devices in the class Office. (-) The maximum temperature on the upper side is 46.2 °C / 115 F, compared to the average of 33.9 °C / 93 F, ranging from 21.2 to 62.5 °C for the class Office. (±) The palmrests and touchpad can get very hot to the touch with a maximum of 37.6 °C / 99.7 F.
(-) The average temperature of the palmrest area of similar devices was 28.2 °C / 82.8 F (-9.4 °C / -16.9 F). Not only a strong battery contributes to a long runtime, the power consumption has to be kept as low as possible as well. This seems to be the case in idle mode. When the laptop is set to energy savings mode, so when wifi is disabled and the brightness at minimum, Acer's TravelMate TimelineX 8573TG only consumes 8.1 watts. 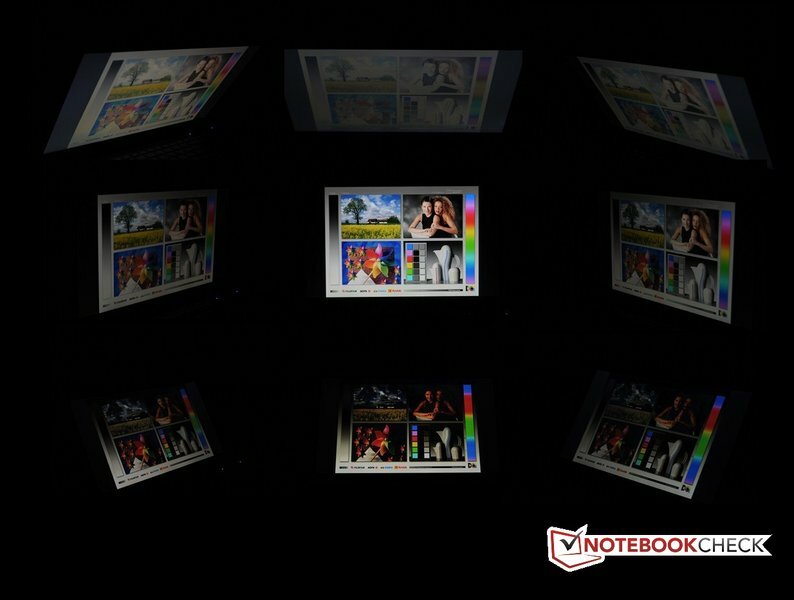 The notebook only needs a bit more in high performance profile and maximum brightness settings with 10.3 watts. The power consumption increases considerably during load. The recorded peak rate was 66.8 watts. However, this rate varies strongly due to the Turbo Boost mode. Seeing that a battery life of about 8 hours is specified, you would think that the battery life is one of the Acer TravelMate TimelineX 8573TG's strengths. However, the Acer laptop gave up after mere 6 hours and 32 minutes in BatteryEater's Reader's test. This is executed in energy savings mode and in the lowest brightness level. Surfing on the Internet was possible for 4 hours and 54 minutes in medium brightness and enabled wifi. The test device lasted for 4 hours and 48 minutes when playing a DVD in maximum brightness. We looked at the laptop's battery life in its high performance profile with BatteryEater's Classic test. The brightness was again turned up to full for this. The fun ended after 1 hour and 30 minutes. Acer still owes us the promised 8 hours. Nevertheless, the battery life isn't at all bad for a 15 inch notebook. Acer supplies a solid notebook with few drawbacks by way of its TravelMate TimelineX 8573TG. The TravelMate TimelineX's refresh is a success. First, the laptop impresses with a good workmanship. The case is stable and even looks elegant. The built-in processor, Intel's Core i7 2620M, provides a good deal of computing power. The battery life is decent for a 15.6 inch device. There's hardly anything left to be wanted in terms of the TravelMate TimelineX 8573TG's connectivity. The display is a minor drawback. Although it's anti-glare, the brightness should have been higher. The contrast could also have been stronger. Besides that, the system gets a bit too warm in stress situations. Only a UMTS module is missing as a nice feature. Consumer laptops with the same configuration are available for a considerably lower price. However, they usually lack business features, such as a docking port, a fingerprint reader, a TPM chip or a matt screen. If you put value on these features and can ignore the drawbacks, you'll get an attractive 15.6 inch notebook for just under 1100 euros. The workmanship makes a good impression. Acer specifies the battery life with over 8 hours. The display's hinges are made of metal and do a good job. There is even a USB 3.0 port available on the laptop. Nvidia's Optimus contributes to the good battery life. There is a port for a docking station installed. Acer gives the dollar sign its own key. Acer's TravelMate series has grown by another good product. The case, the computing power and the battery life. A UMTS module would upgrade the notebook even more. Why the heat is discharged so badly.